As you can see, in this case, there is a shared bookmark by “Adam Greco” and a shared bookmark by “Greco Inc.” While based upon his supreme prowess with SiteCatalyst, you might assume that Adam Greco’s bookmark is credible, that might not always be the case! Adam may have shared this bookmark a few years ago and it might no longer be valid. 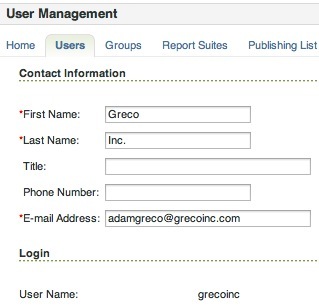 But if your administrator shares the second bookmark above while logged in as “Greco Inc.,” it can be used as a way to show users that the “Onsite Search Trend” report is sanctioned at the corporate level. If you have a large organization, you could even make a case for never letting anyone share bookmarks, dashboards or targets and only having this done via a corporate login. One process I work with clients on, is to have end-users suggest to the web analytics team reports and dashboards that they feel would benefit the entire company. If the corporate web analytics team likes the report/dashboard, they can login with the corporate ID and share it publicly. While this creates a bit of a bottleneck, I have seen that sometimes large organizations using SiteCatalyst require a bit of process to avoid chaos from breaking out! Another related technique that I have used is adjusting the naming of SiteCatalyst elements to communicate that an item is sanctioned by corporate. In the examples above, you may have noticed that I added the phrase “(CORP)” to the name of a Dashboard and a Target. While this may seem like a minor thing, when you are looking at many dashboards, bookmarks or targets, seeing an indicator of which items are approved by the core web analytics team can be invaluable. This can be redundant if you are using a corporate login as described above, but it doesn’t hurt to over communicate. 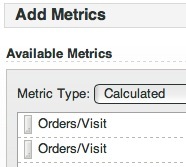 This concept becomes even more important when it comes to Calculated Metrics. It is not currently possible to manage calculated metrics and the sharing of them in the same manner as you can for bookmarks, dashboards and targets. 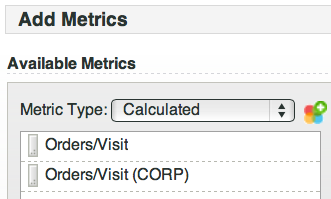 The sharing of calculated metrics takes place in the Administration Console so there is no way to see which calculated metrics are sanctioned by the company using my corporate login method described above. This makes things much more clear and is an easy workaround for a shortcoming in the SiteCatalyst product. When you have several analysts in an organization working in SC, how do you recommend they share dashboards and segments? For example, if one analyst created most of the dashboards and segments in his account, what is the best way for us to go about sharing that so other analysts can update and make changes to the dashboards? Is it best to transfer it to a corporate account? How about if we want to split the work of a large dashboard between two analysts, what do you recommend as a best practice? Should we use the corporate login and then take turns logging into the account to do our parts? Or is is better to split the work in the analysts own account and then transfer everything to the shared corporate account?